Man Behind Lens: They Shoot Fishes, Don't They? They Shoot Fishes, Don't They? In 1986, while working for The Star newspaper in Penang; I accompanied a reporter to complete a story on Discus fish breeding on Penang Island. 1. Little did I know that Penang is a major exporter of ornamental Discus fish in the world! 2. Discuses are the most beautiful tropical fish I ever seen and I easily got bitten by "discus fever"! 3. 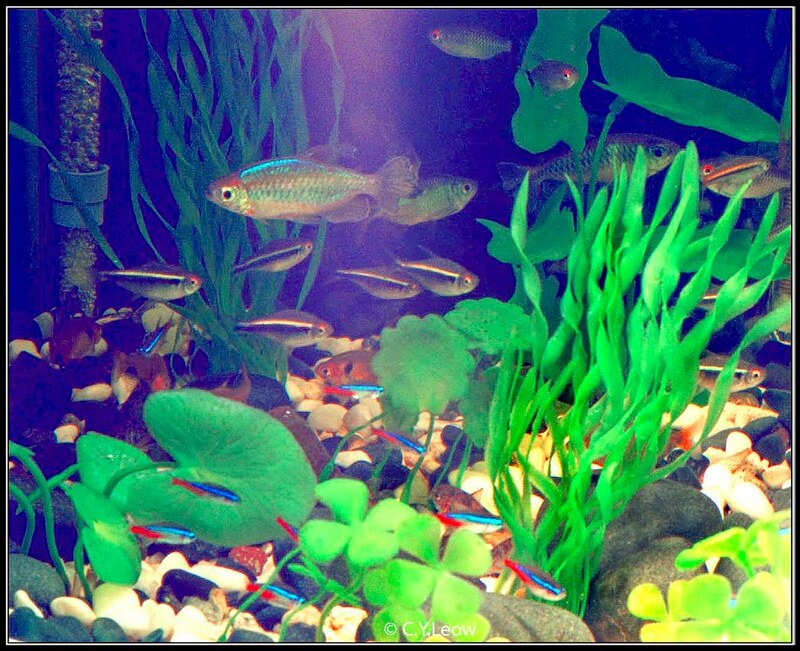 It is VERY difficult to light up a huge glass aquarium for photography! 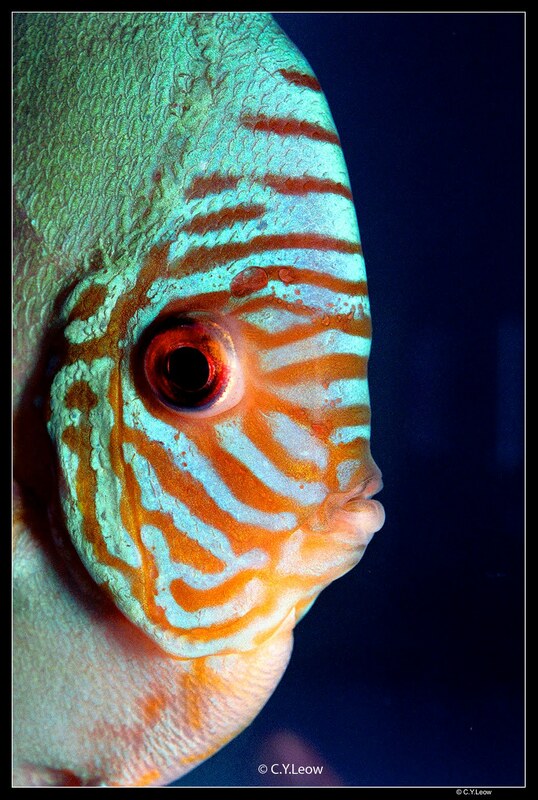 Discus (Symphysodon spp.) 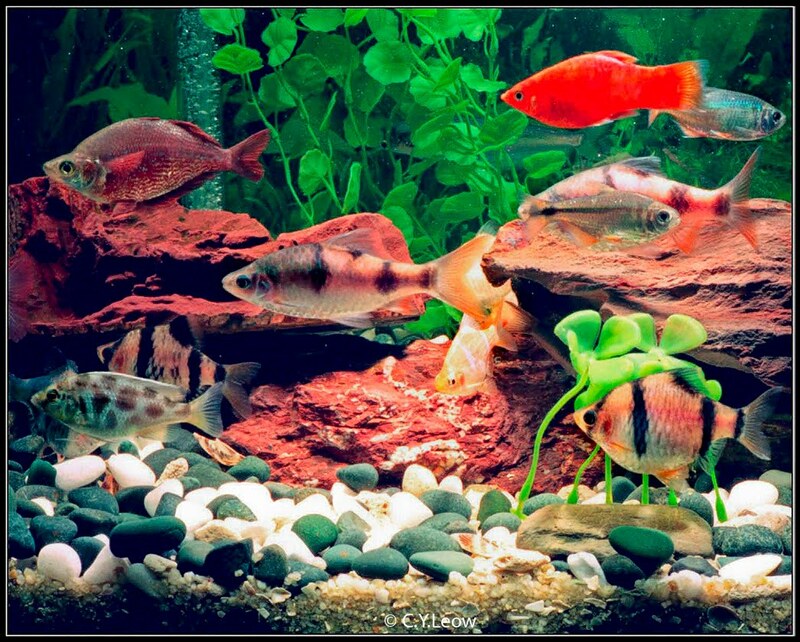 are a genus of three species of cichlid freshwater fishes native to the Amazon River basin. Discus are popular as aquarium fish and their aquaculture in several countries in Asia is a major industry. 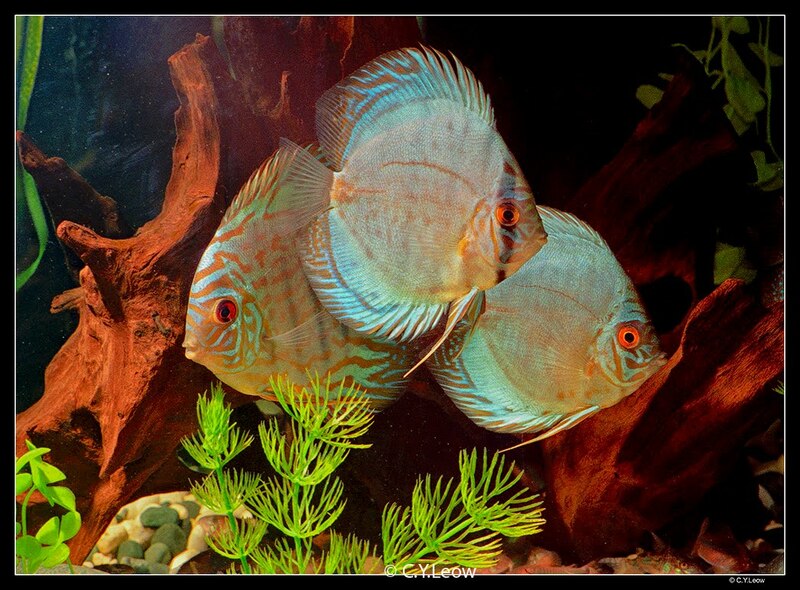 "Penang Island lead in the breeding and export of Discus. As it has the best water quality required for breeding and raising Discus - pH value of 6.8 to neutral and a conductivity 60 to 80 microsiemens. 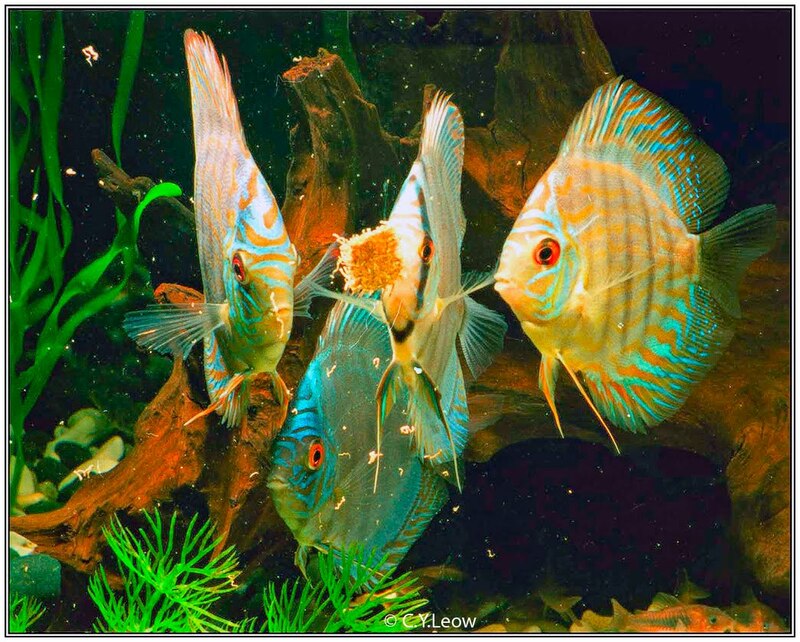 At the height of Discus Breeding in Penang (1987 - 1993) there were about 30 Discus farm of various sizes, ranging from a 100 to 500 Grow-out tanks with 20 to 50 breeding pairs and about 120 home-breeders with 30 to 80 tanks with 10 to 20 breeding pairs. 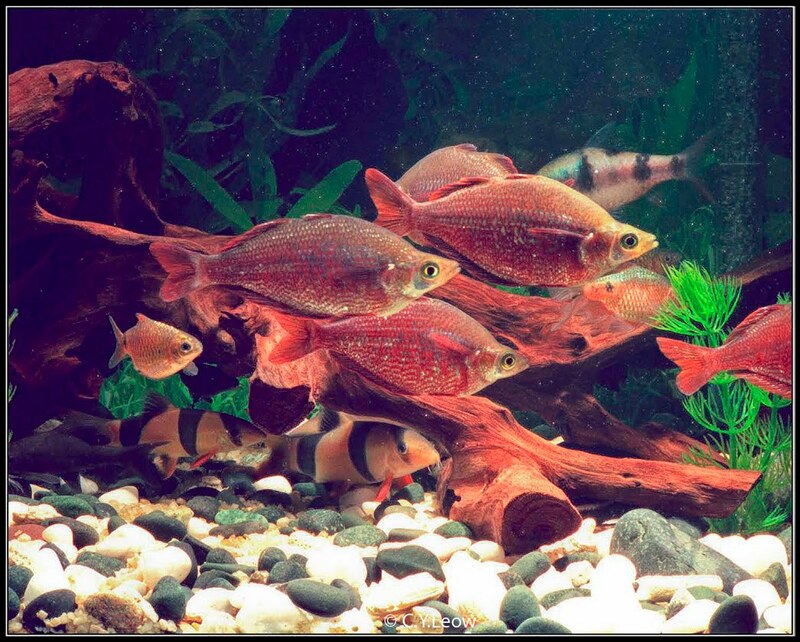 (Grow-out Discus tanks are usually 250 litres and breeding tanks are usually 125 litres, though smaller capacity tanks are used depending on the preference of the breeders.)" On that fateful day at the Discus farm, I was given a pair of 50 cents size "Cobalt Discus". I bought a "two footer" glass aquarium tank and thought that keeping Discus are no brainer! The Discuses K.O. on me! The next few months was a long journey of many books, research; more fishes, more died! More money spent, my aquarium tank got larger and larger till I ended up with a "ten footer"! By then, I am getting quite good at it and I had some really nice looking fishes! My Discuses enjoying freeze dried worms. Lighting set up as describe below. After many experiments and lots of colour films, prints; I perfected the lighting set up for photographing my tanked tropical fishes! The four units of "hammer heads" flashes were made by Sunpak and each take 4 rechargeable AA batteries. Each flash cable has a "slave sensor" connected. The flashes were placed on top of the glass cover, pointing into the tank. My camera of choice (at that time) was my faithful Leica M4-P with the 50/2 Summicron-M lens. A small flash on the Leica was pointing towards the ceiling, when the camera fire; the bounced light will trigger all the four hammer-head strobes! Trail and error! Remember this was the none digital days! After many many shots and prints and jotting down the exposures, I arrived at an optimal setting. What they don't know was that Discus, after you have them for a while; they seems to "recognise" their master! The moment I lightly tapped the aquarium front glass, they will come out from their hiding place (at the back of the drift wood) to greet me! 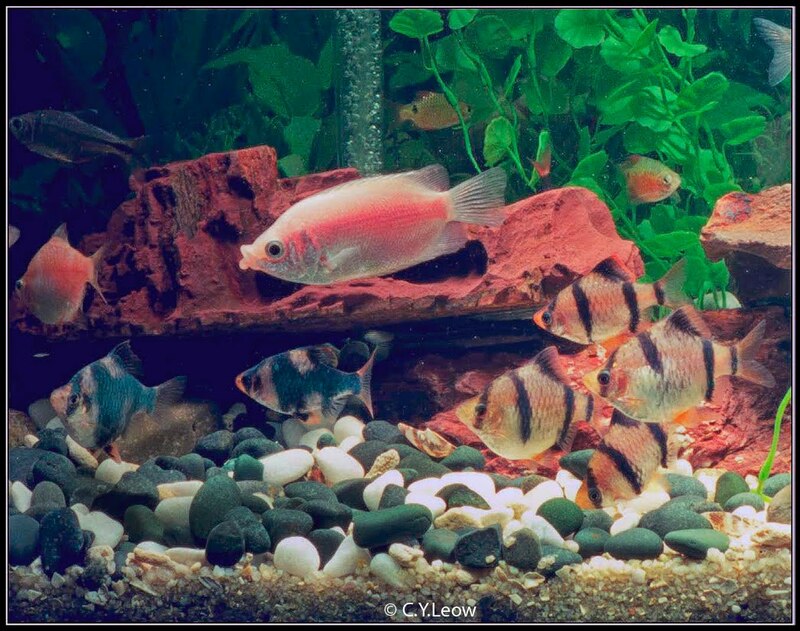 Apart from Discuses, I also kept other tropical fishes, pictures below were taken with the same lighting set up. I love Barbs, especially the Tiger Barbs. 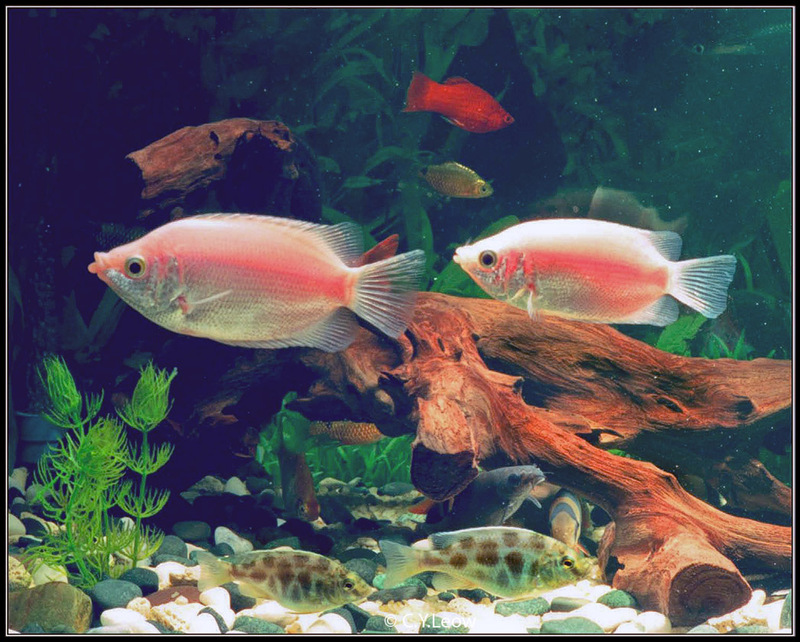 The nice pink pair were the "Kissing Gourami", the delicate Tetras and the Neons! The mouse like bottom feeding Crown Loach were my favorites too! This close-up shot of a prize winning Discus was shot by me while working in Singapore. A Canon Speedlight was softened with a diffuser. The lens was a Canon 50/2.5 Micro mounted on a EOS1 camera loaded with Kodak Ektapress 400 film. 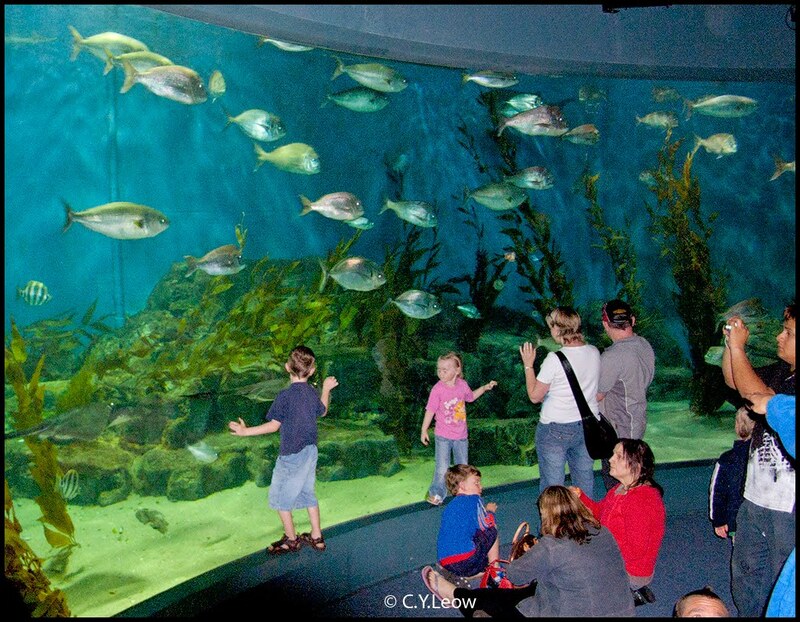 The giant marine tank at the Melbourne Aquarium. Shot taken with a Nikon Coolpix 8400 and it's tiny built-in flash. See how bright the tank is! 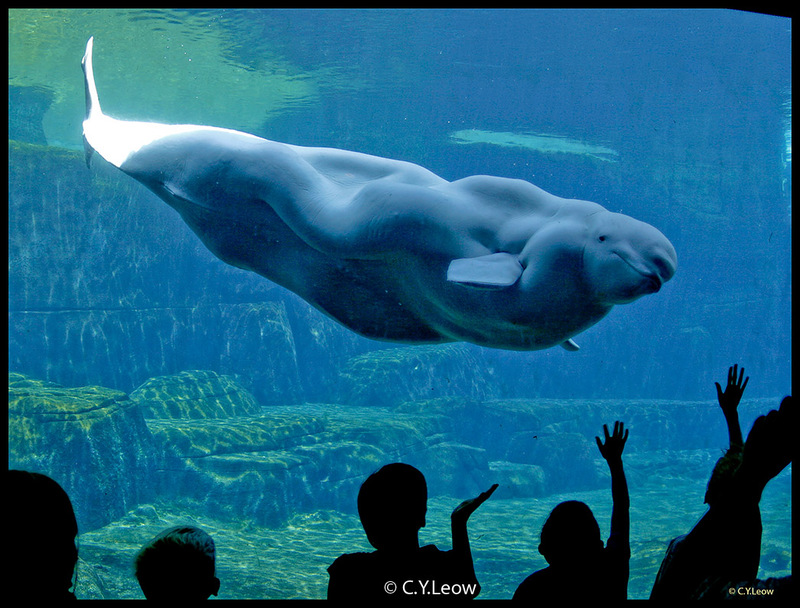 A Beluga Whale at the Vancouver Aquarium was taken with a Canon 30D DSLR with a Canon 15/2.8 fish-eye lens. 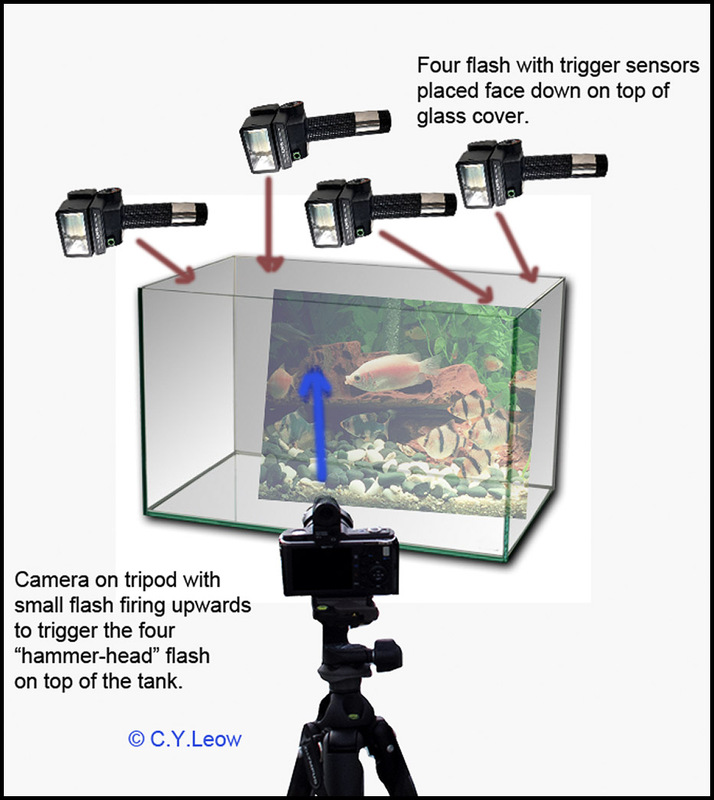 With the advent of digital camera technology, shooting pictures of tanked fish would be a breeze! Nowadays, even mid range DSLR came with mega pixel ccd that are low noise and high resolution. Unlike the film era where we were always control by film cost, you are now able to shoot hundreds if not thousands of shots to select the best one! 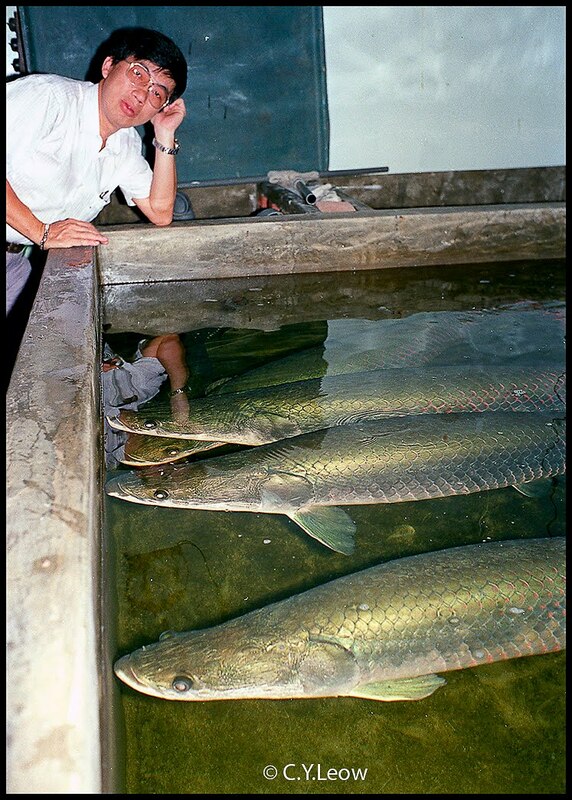 Those "giant fish" at the KL aquarium shop are adult arapaima fishes, known as the pirarucu in Brazil and the paiche in Peru, this South America giant is one of the largest freshwater fish in the world. Some reach lengths of more than 10 feet (3 meters) and weigh upward of 400 pounds (180 kilograms). Amazing colours! Who said there was no God!The Beluga whale looks sensational close up.Those photos would be the perfect photos to have on the wall to awake to every morning.If I didn`t know better I would say they were colour co ordinated. Lovely!